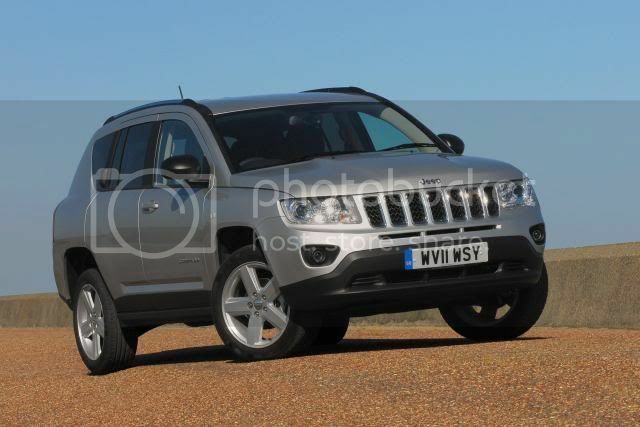 Jeep has announced prices of the revised Compass compact SUV. Starting from £16,995, the Compass undercuts all rivals, before topping out at £23,995. Initially, two trims will be available; Limited and 70th Anniversary before entry-level Sport and Sport+ are added later on. Three engines will be on offered; a 2.0 litre petrol, 2.4 litre, and a 2.2 CRD from Mercedes. The latter will be linked to a 6 speed manual while a CVT will be married to the 2.4 litre. Base Sport and mid-lower Sport+ models are equipped with 17” alloy wheels, cruise control, front fog lights, x6 airbags, and active front headrests, x4 electric windows, electrically adjustable/heated/folding door mirrors, remote central locking, air conditioning (climate control for Sport+), Bluetooth, leather steering wheel, trip computer, CD player w/AUX input, and 60/40 split folding rear seats. Mid-sped Limited and range-topping 70th Anniversary features 18” alloy wheels, chrome exhaust pipe, leather interior w/heated front seats, 6-way electrically adjustable driver's seat, and 6CD autochanger. 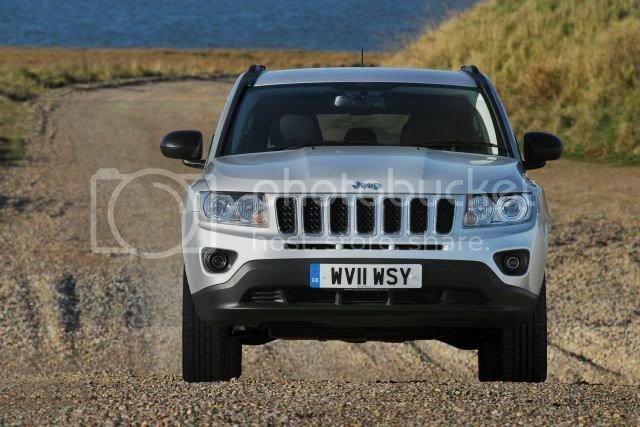 The new Compass 4x4, which goes on sale here on 15 April, heralds an exciting future for the iconic Jeep brand. As the company celebrates its 70th anniversary, its prospects have never looked brighter, and a wide range of new products, including an all-new Grand Cherokee, are already entering Western European markets. British car buyers will see an early example of this activity in the shape of the sleek new Compass. Even though it’s the first new generation Jeep to offer two-wheel drive versions, Compass still personifies the brand’s unique DNA, symbolising free-spirited adventure, the authenticity of the original 4x4, and mastery of adverse conditions both off and on-road. 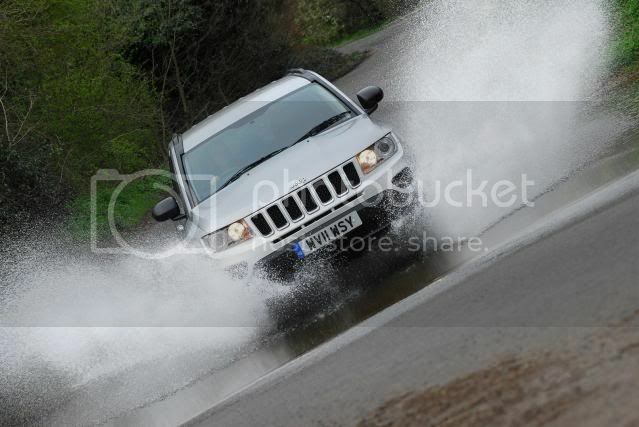 This will continue to be the foundation for every Jeep and has proven appeal to customers’ emotional side. But new Jeeps also aim to appeal to buyers’ rational side and the Compass is the ideal product to instigate this shift in perception. Competing in the rapidly expanding compact SUV segment, Jeep’s new Compass range has been designed to appeal to a wide audience. New two-wheel drive versions put it within reach of hatchback owners who want to trade up. These buyers don’t need four-wheel drive, but want the styling, image and practicality of a Sports Utility Vehicle (SUV). The Compass allows them to have just that with the authentic Jeep experience thrown in for good measure. At the other end of the scale, Compass offers a credible 4x4 to buyers who are downsizing from larger models. The Jeep name has unrivalled credentials in this market and the Compass now has a true premium feel thanks to the improved quality of its new interior and the Grand Cherokee inspired looks. Throw in the high levels of specification you’d normally expect in larger cars, plus a three-year or 60,000-mile warranty, and the competitively priced Compass makes owning a Jeep not only attractive but also accessible. 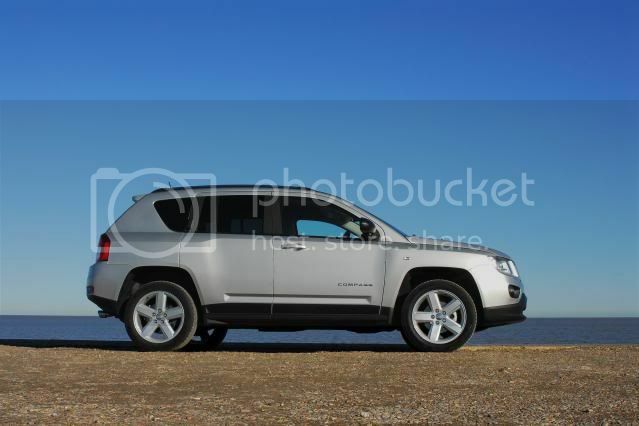 The new-for-2011 Jeep Compass has undergone a comprehensive redesign inside and out to appeal to a wider customer base. It blends strengths from the previous model such as high equipment levels, affordability, interior flexibility and economy, with a sophisticated design, revised chassis, advanced new line-up of engines and a completely revised cabin. As the firm’s first ever compact SUV, the Compass brought the authentic Jeep experience to a new type of buyer. Now it’s set to repeat that feat, thanks to new two-wheel drive versions that will be sold alongside the 4x4 to make the Compass even more affordable. Part of the inspiration for the original model was to appeal to buyers who may have thought that a Jeep was beyond their means. The new model builds on that principal with a wider range than ever before and prices stretching from £16,995 to £23,995 OTR. There will be four trim levels, with 4x4 Limited and 70th Anniversary versions on sale this month. The entry-level Sport and Sport+ versions will join the range in August. There will also be a choice between three different engines, two petrol and one diesel. These have four power outputs and offer significantly improved performance and economy over the engines they replace. With its steeply raked windscreen, roof rails and side mirrors sculpted in Chrysler’s state-of-the-art aero-acoustic wind tunnel to reduce drag and wind noise, the Compass has always had a sporty shape. These properties have been maintained, even though the details have been extensively re-worked to reflect a more modern incarnation of the brand, while retaining the classic Jeep design ‘language’ thanks to the seven slot grille and trapezoidal wheelarches. And to underline the improved quality of the Compass, several exterior details are now ringed with chrome. The grille combines with a new bumper, front valance, quad reflector head lights and projector fog lights to give a sleek and sophisticated look. The bonnet now further enhances this with its subtle power bulge, hinting at the Jeep’s bold attitude and all-weather abilities. New cladding on the doors and sills helps fend off debris during off-road driving and also gives the Compass a more assertive look. And the rear door handles remain hidden in the C pillar to help put the emphasis on the rugged shoulder line stamped into the doors. At the back, a new rear valance and LED tail lamps combine with a new rear tailgate spoiler to give a more premium appearance. The look is capped with newly designed roof rails that have been slimmed down to give the Compass a sportier silhouette. The Limited and 70th Anniversary models get a chrome exhaust tailpipe and sit on new-look 18-inch alloy wheels. The Sport and Sport+ sit on 17-inch alloys as standard. One of the most appealing elements of the Compass has always been its ability to deliver the performance of an SUV combined with the price, handling and fuel economy of a compact car. The latest model builds on that with an all-new interior that demonstrates the style, refinement, safety and high specification level normally associated with larger models. The extensively redesigned cabin features softer and higher quality materials along with bright chrome accents and a long list of standard equipment added for the 2011 model. There is now soft touch padded trim on the upper surface of the front doors. And the new centre armrest has undergone a similar treatment and now has a split lid for additional storage. The luxury feel goes further still with standard fit cruise control along with backlit switches for the door handles and locks, power mirrors and windows. And safety is a given with active front headrests, and next-generation multi-stage front airbags with side curtain front and rear airbags as standard. To put the Compass on the ‘radar’ of a broad buyer spectrum, the Sport, Sport+, Limited and 70th Anniversary trim levels cover a wide range of specifications. This allows Compass to appeal to hatchback owners looking to trade up, as well as competing at the upper end of the compact SUV segment and ‘capturing’ downsizing drivers. Demonstrating an impressive level of standard equipment, every model has automatic climate control, apart from the Sport which features manual air-conditioning. Front seat passengers sit in sumptuously padded bucket seats, covered in leather with accent stitching in the Limited and 70th Anniversary models, premium cloth in other versions. A six-way power adjustable driver’s seat and heated front seats are standard in the Limited and 70th Anniversary. All models feature chrome rings surrounding the air vents, while illuminated cupholders in the centre console emphasise the feeling of quality already given by the leather wrapped handbrake and steering wheel. The driver looks at LED backlit gauges in the instrument binnacle and holds a new Jeep steering wheel. This adjusts for rake and features integrated controls that allow operation of the sound system, cruise control and handsfree phone. It doesn’t just look stylish, the Compass has plenty of kit to make life as a driver and passenger more comfortable, more fun and more efficient. Electric windows are standard throughout, with the driver’s a one-touch for added convenience. The folding mirrors too are electrically operated and heated and there’s remote central locking. Inside, the electronic vehicle information centre incorporates a trip computer and displays crucial stats such as average mpg, distance to empty, a compass, and the outside temperature. The padded armrest over the centre console slides up to three inches to suit all shapes and sizes. And the storage bin it covers is cavernous. Handily, it contains a 12-volt power socket for charging mobile phones and MP3 players. Because Jeep appreciates that a family car can never have enough storage space, there’s a generous glove box and an extra large bin above it along with usefully sized door pockets. Sport and Sport+ models feature a Media Centre CD player and MP3 compatibility, while the Limited and 70th Anniversary add a six CD system. All models come with four speakers and an audio jack for connecting MP3 players. Owners of Sport+ models and above have a USB socket and can connect their mobile phones and use them handsfree with Uconnect Bluetooth. The Uconnect sound and navigation system is available as an option on Limited and 70th Anniversary versions, featuring a 30-gigabyte hard drive which can store thousands of songs and allow operators to format playlists, and view picture files and videos. The user-friendly Uconnect, operated via a 6.5-inch touch screen, also incorporates a navigation system with real-time traffic information. To ensure music fans get the most out of their stored tunes, the sound and navigation option incorporates a Boston Acoustics premium sound system. This features an eight-channel 368-watt amplifier with nine speakers including a powerful subwoofer. Speakers that flip down from the tailgate when it’s open, mean owners can enjoy their music from outside the car too. 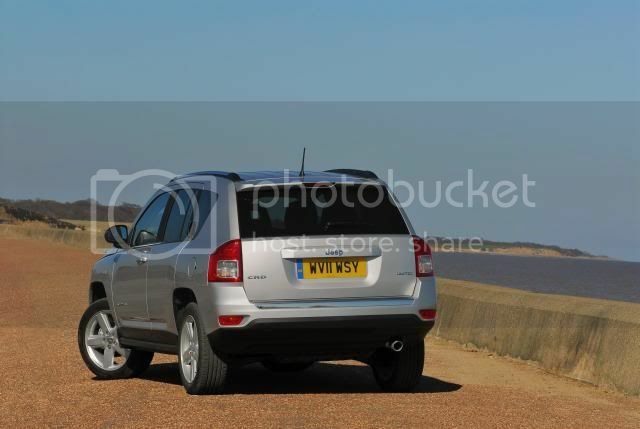 High specification aside, the main principal behind the Jeep Compass has been to get the basics right. The rear seat is a good example with plenty of leg, head and shoulder room for three people. The back rest will recline through 12 degrees to enable occupants to relax, and it also splits 60/40 and folds forwards. And because when it folds forwards it folds flat, it enables owners to make the most of the space they’ve got, especially when combined with the flat-folding front passenger seat. Even the boot light has multiple roles: you can unclip it and it becomes a bright torch. A new-look engine line-up underpins this latest Compass range. It features three capacities and four outputs, each of which has been designed to combine performance with refinement and fuel economy to satisfy multiple uses. For the same reason, the Compass is the first new generation Jeep to feature versions with two as well as four-wheel drive. The majority of sales – about 65 per cent – are expected to be the new 2.2-litre CRD turbo diesel engine. This comes either with 134bhp or as a high output 161bhp version. It’s an in-line four cylinder Mercedes-Benz engine, co-developed specially for the Compass, and featuring the latest common rail technology. Compared to the two-litre engine it replaces, the high output version has a 23bhp increase in power, while its 320Nm of torque is 10Nm greater than the engine it replaces. Available from just 1400rpm this cuts the amount of gearchanges needed to make driving effortless, particularly in traffic. A further benefit is a significant increase in fuel efficiency over the previous unit. The petrol engines have a capacity of either 2.0 or 2.4-litres and are Chrysler’s adaptable ‘World Engines’. Both these units feature dual Variable Valve Timing on the twin overhead camshafts. This electronically controlled timing produces more power, better fuel economy and smoother, quieter operation. Proving their cutting edge credentials, the engines also feature an aluminium block, four valves per cylinder, forged crankshaft and connecting rods, and intake manifold and exhaust flow control valves. These engines are expected to make up around 35 per cent of sales. The 2.0-litre petrol engine comes with a five-speed manual gearbox while the diesel cars all feature a smooth shifting six-speed manual. The 2.4-litre is the only engine in the range available with the CVT2 Continuously Variable Transmission. All cars feature electronic throttle control in place of the mechanical throttle linkage. This gives a seamless and consistent engine response and integrates with technologies such as the variable camshaft timing to improve fuel economy. Jeep is of course famous for its legendary go-anywhere ability, and the Compass is no different. The 2.4 petrol and 2.2CRD high output engines both feature Jeep’s Freedom Drive I. This is a full-time active four-wheel drive system featuring a locking mode that gives owners reassuring performance in low traction conditions. For normal driving, power is sent to the front wheels in order to save fuel. But the system automatically shifts power from the front axle to the rear axle as needed, (when wheel slippage is detected), using an Electronically Controlled Clutch. The system also features a locking function to send an equal amount of power to the front and rear for maximum traction in demanding terrain. This takes the form of a lockable centre coupling. Pulling up on the chrome T handle on the centre console disables the automatic function and enforces a torque split of 50-50 between front and rear wheels, enabling the driver to cope with deep snow, sand or other slippery surfaces. With regard to two-wheel drive versions, many of Jeep’s legendary attributes are retained. There’s up to 209mm of ground clearance, which gives the Compass an ability to ford water that’s up to 279mm deep. On top of that, a 20-degree approach angle, 20-degree breakover angle and 32-degree departure angle ensure that even with two-wheel drive only, this machine is as competent in the rough as many rivals’ four-wheel drive offerings. Whichever engine owners choose, they’ll have a capable towing car with the capacity to pull up to 2000kg depending on engine choice. The whole package makes for a reassuringly dependable machine that will cope reliably with almost anything a notoriously unreliable world will throw at it. As you would expect of a car designed from the ground up to cope with the everyday rigours of family life, the Compass has safety built in. It is constructed around a safety cage structure with an ultra high strength roll-formed steel cross beam and front crumple zones. Side impact beams are built into the doors for improved protection and there are advanced multi-stage front airbags. These adjust their output according to the severity of the impact and work with side curtain airbags at the front and rear. The new Compass also features new active head restraints built into the front seats to help limit whiplash injuries. But every effort is made to ensure crashes are avoided in the first place. Every Compass features powerful disc brakes all round. New quad reflector headlights and high output projector fog lights (standard on all versions) maximise visibility at night and in bad weather. And the suspension has been re-tuned to improve the Compass’s behaviour on-road. Independent suspension all round has new higher spring and damping rates, added rebound springs and a larger diameter rear anti-roll bar to improve refinement and ride quality. It also enhances the driving experience and ensures that the Compass reacts instantly and predictably to driver inputs. MacPherson strut front suspension and a multi-link rear suspension are tuned for superior ride, handling and noise reduction. And to ensure the driver maintains control, even during extreme manoeuvres, Electronic Roll Mitigation (ERM) anticipates the potential for wheel lift by monitoring the driver’s steering wheel input and the speed of the vehicle. When ERM determines that the rate of change of the steering wheel angle and the vehicle’s speed are sufficient to potentially cause wheel lift, it applies the brake of the appropriate wheel and may also reduce engine power. ERM will only intervene during very severe or evasive driving manoeuvres. This system works alongside Electronic Stability Control which monitors and responds to wheel slippage and is standard throughout the range. It’s also switchable, so more enthusiastic drivers can limit the electronic intervention for improved progress off-road. On manual transmission versions, Hill Start Assist helps the driver make a seamless hill start by automatically holding brake pressure for a short period after the driver’s foot is removed from the brake pedal. The Jeep brand’s legendary heritage and capability have made it iconic. Since they were first produced in 1941, Jeep vehicles have been the authentic benchmark for off-road capability, and the new Compass SUV builds on seven decades of this legendary heritage to provide class-leading capability, craftsmanship and versatility, providing customers with a sense of security to handle any journey with confidence.